Calls for slow-driver legislation | What Car? 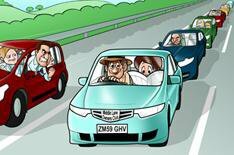 People who drive too slowly should be forced off the road, according to the Association of British Drivers (ABD). The lobby group is calling for the introduction of laws to make slow-moving vehicles pull in and allow faster vehicles to pass in an attempt to make the roads safer. It made the comments after comparison website confused.com published research that revealed 60% of motorists get stressed and irritated by slow drivers. The ABD is not, however, supporting proposals by the comparison website for minimum speed limits enforced by cameras. If everybody drove at the speed a reasonable person would expect to travel, the roads would be much safer, less stressful places for all, said ABD chairman Brian Gregory. Unfortunately there will always be those who wish to travel either dangerously fast or far too slow causing congestion and prompting rash behaviour.